Many people suffer with shoulder pain, especially as we age into our 40s, 50s and beyond. Pain felt in the shoulders may originate from the neck, the heart, the lungs and many other organs. If you suffer with persistent shoulder pain, it’s important to get evaluated by a health care provider to determine the cause. To learn how to find a good physical therapist, refer to my BLOG on finding a good PT. If the shoulder pain is musculoskeletal in origin, it’s often due to problems with the rotator cuff. In fact, about two-thirds of all shoulder pain comes from an injury to the rotator cuff. Unfortunately, 56% of people with shoulder pain never seek medical care! You need your shoulders – get help if they hurt! The Rotator Cuff is the name of a group of 4 muscles (Supraspinatus, Infraspinatus, Teres Minor and Subscapularis) that live on your shoulder blade and attach to the top of your arm bone. As a group, the rotator cuff’s job is to keep the head of the arm bone centered in the socket of the shoulder blade as we move the arm. For example, when we lift our arm overhead, the rotator cuff muscles fire to keep the arm bone centered, preventing it from elevating along with the arm. As you can see from the anatomy above, if the arm bone slides up, it bumps into the bony roof made up of the clavicle and acromion. When this happens over time, it can create rotator cuff injuries. Rotator cuff injuries can occur in the muscle itself (pictured in red) or in the tendon (pictured in white), the part of the muscle that attaches to the bone. Tendons are particularly susceptible to injury because they lose blood supply as they age and because they live where all the action is, which can lead to micro-trauma and overuse. Injuries to either the muscle or tendon lead to poor performance of the rotator cuff group as a whole. Over time, the injuries affect the muscles’ ability to keep the arm bone centered in the socket with movement. When this happens, the rotator cuff muscles may become inflamed and irritated from the excess motion. 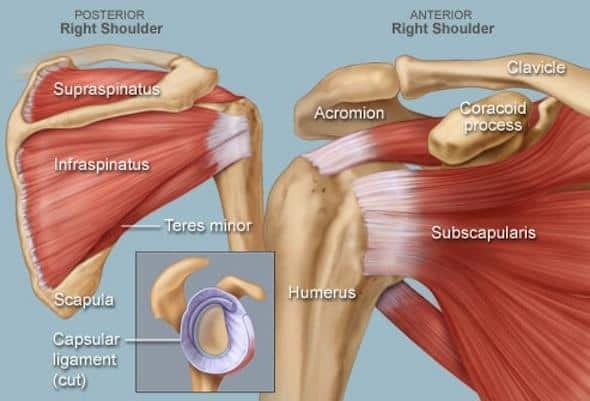 The most common symptoms of rotator cuff injuries are pain with movement, especially movement over shoulder height; pain with reaching behind the back (like tucking in a shirt or scratching the middle of your back) and pain with even light loads extended from the body (especially overhead). Patients also describe difficulty lying on their side to sleep. Rotator cuff injuries may occur from an event like a fall, from overuse, or come on slowly as with aging. Avoid painful positions and activities. Because the muscles and/or tendons are inflamed, injured and irritated, activities which generate pain are a sign of further injury. This is not a “push through the pain” injury. Stop doing the thing that hurts your shoulder. Ice your shoulder and shoulder blade if actively painful and after activity. Ice is an easy way to reduce inflammation without side effects. Use a protective barrier between ice and your skin and ice your shoulder for 15 minutes a few times each day. Try to regain normal pain free range of motion by performing gentle stretching exercises while lying down or with help from your other arm. Perform gentle isometrics. Isometric exercises that target the rotator cuff are a safe way to improve blood flow, increase muscle strength and reduce swelling. See a physical therapist. A physical therapy examination and treatment can provide guidance as to whether you have a full or partial rotator cuff tear, what exercises are most important for you, and how to manage the pain and heal from the rotator cuff injury. Most rotator cuff injuries recover non-surgically with physical therapy. Healing can take weeks to months, depending upon the nature and region of injury. For full thickness tears, it may be appropriate to be evaluated by an orthopedic surgeon who specializes in shoulders as soon as possible after the trauma. As with any injury, have faith! Given the right environment, the body is very resilient and most rotator cuff injuries recover conservatively with physical therapy. If you have shoulder pain and think you may have a rotator cuff injury, contact Life’s Work Physical Therapy today at 503-295-2585. Thank you for the tips! I have been experiencing this for days and it’s frustrating me. I can’t do my usual day-to-day activities around the house. Thanks for sharing this amazing blog and you have covered every aspect of rotator cuff injury & treatment. Keep up the good work and I am looking forward to your next blog. Thanks so much! We’re glad you enjoyed it.